For Patty, Melissa, Scotty, and Travis, it really is a family affair. 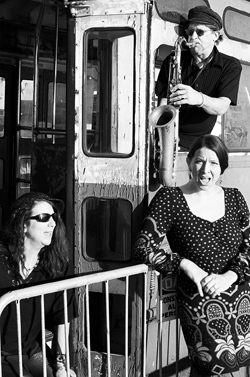 This foursome stretches their biological connections through to their creative tissue as the Dysfunctional Family Jazz Band (DFJB), an incomparable collective with a Jazz/Americana/Soul/Folk sound that, by all reasonable accounts, functions quite nicely, thank you. As the history of their marvelous and complex family relationships comes out in their music, it is clear that this is a community, a truly relational organism. The way they work, the way they live, and the way they make music is an expression of family, through and through. The high-functioning dysfunction began when Patty Carpenter and Scotty Shetler were high school sweethearts a billion years ago, and, in 1972, had a daughter, Melissa Shetler. Then they split, and Scotty married Jill Gross, a lead singer in the band he was playing with. Now, Jill sometimes sings with them both live and in the studio. Patty married Charles Light, who manages the band, and, in 1990, they had a son, Travis Light, who at 17 moved to New York City to live with his sister Melissa and her husband Alan McCarthy. True to his family roots he is now living in California attending Jazz School. Yes, you are correct; this would be easier with flow charts and a laser pointer. The complexity, however, bears beauty for them, and the multi-faceted nature of their almost three generational family is expressed in their music. Patty composes and plays keyboards and sings. Melissa handles vocals and melodica. Scotty is a wind man on tenor sax, clarinet, baritone, penny whistle, and even mandolin. Twenty year old Travis lays down the bass. The wealth of talent in this gene pool is astonishing, and while they will admit that the inherent tension of working with family increases the drama, it also increases the reward. The musical mélange here puts the funk in dysfunctional. Patty studied Jazz at the University of Massachusetts, Amherst with the great Archie Shepp and Max Roach, and was heavily influenced by many great women artists from Joan Baez and Roseanne Cash to Billie Holiday and Carmen McCrae. Scott was nearly born with a mandolin in his hand and is now a fantastic windbag. He has also scored big as a songwriter, co-writing the Jon Bon Jovi hit “Show Me the Way” with Mighty Sam McClain. Melissa danced to Coltrane from the moment she could walk and has a deep love of African and Latin music and harmony. Travis has had a fascinating journey to discovering his love of the bass guitar. The soulful, grooving result of this massive mix is kind of crazy, and kind of brilliant. A very significant chapter of their history, one that has constant impact on their music and relationships today, was the 10-14 years spent living on Communal Farms. Described by Patty as “both really wonderful and really difficult,” the communal life deepened their dependence on each other practically and creatively and wove creative communication into the fabric of their family. Many of the themes of their music and activism are reflections of their life on the farm, including the priority of nature and the natural world and their passionate involvement in the anti-nuclear, peace, and environmental movements. While some families gather in a room to watch a movie, this gaggle gathers to record an album. “Come Over” is a collection of connected songs written by Patty and her close friend, and fellow communard, poet Verandah Porche. Covering a great amount of emotional and musical ground, this album weaves through genres and styles as deftly as it does personalities, moods, and priorities, presenting songs that carry the emotional weight of life and living. Rather than just a collection of songs, the album tells a story. It is as impeccable as it is expressive, with arrangements by Scotty and session work by Bassist Tony Garnier (Bob Dylan), Drummer James Wormworth (Max Weinberg Seven/Conan O’Brien Show), Brian Mitchell on organ and accordion (Levon Helm Band) and the mastering expertise of Rob Fraboni (Bonnie Raitt, Rolling Stones, Bob Dylan). The result is a record that is, true to form, relational, conversing between the several styles of music and the players who created it, and soundly fulfilling Patty’s desire that Come Over would take what is personal and make it as universal as possible. These days, this tremendous tangled family is a bit spread, with Patty and Charles alternating between Brattleboro, Vermont and Brooklyn, New York; Melissa lives two blocks away from them in Red Hook; Scotty and Jill live in a country farm like house in Boston; and Travis is temporarily parked in the hills of Oakland, California. The kids are adults, the parents are kids again, and the sound is as diverse as they are. With so many moving parts and family foibles, there’s bound to be some dysfunction. However, in this house, dysfunctional is functional, and their talent, their history, and their hard work is all an expression of their commitment to relationship. Relationship with music. Relationship with their fans. Relationship with the family. Relationship with society and the planet. This is where they live. This is the Dysfunctional Family Jazz Band.